Space is limited (12 participants). Cost for the seminar includes one SFRAW Basic Natural first Aid kits for each participants (FREE); a limited supply of additional kits will be available to purchase for a fee. 8) risks with commercial foods/treats, HPP, vitamin-mineral packs used in pet foods, supplement risks, 4D meats, contamination, sourcing for safety, etc. 9) specific risks for certain foods (salmon, pork, wild game, rabbit, lamb, beef, eggs, etc.) and how to eliminate or minimize your dog/cat’s exposure or possibility of related illnesses. 10) the risk of bacteria and food borne illnesses such as viruses, prion disease, parasites, etc. 1) how to determine when it is safe to treat your animals at-home and provide holistic/natural first aid strategies to help avoid unnecessary veterinary visits. Lastly, we will be presenting the SFRAW NATURAL FIRST AID KIT during this seminar! Jennifer and Kasie will take a look inside the SFRAW basic Natural First Aid kit to review what items we have gathered/suggested as most valuable for a basic kit, and how/when to use the contents of our kit. SFRAW is the largest resource for people that feed their pets fresh food in California. 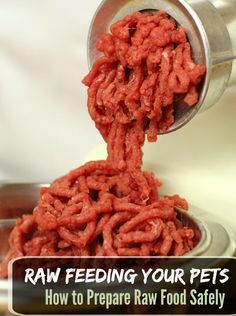 We offer our own locally-made pet treats, raw pet foods, herbs, supplements and therapeutic remedies, as well as an unsurpassed selection of high quality prepared pet foods and exceptional whole food ingredients for those who make their own pet food or follow prey-model, BARF or other styles of feeding. Dr. Luna-Repose received her DVM from Cornell University, College of Veterinary Medicine in Ithaca, New York in 2006. After graduation from veterinary school, she returned to California and completed her internship in alternative and complementary veterinary medicine in 2011. Dr Luna received her acupuncture and Chinese herbal medicine training from the International Veterinary Acupuncture Society (IVAS) and the College of Integrative Veterinary Therapy (CIVT). Dr. Luna has a professional interest in pain management, preventative medicine, treatment of cancer and gastrointestinal disorders, herbal medicine, therapeutic nutrition and homeopathy. Dr. Luna is also certified in first degree Usui Reiki. Prior to 2006, Dr. Luna worked as a licensed veterinary technician and also conducted research in various countries around the world. At age 19, Dr. Luna went on a trip to Borneo to rehabilitate orphaned or reclaimed orangutans back into the wild with world renowned primatologist, Dr. Birute Galdikas. Many orangutans are sold as infants on the black market as pets or for viewing at zoos all over the world. Officials in Borneo would confiscate the orangutans and bring them to the care of Dr. Galdikas to rehabilitate them and release them back into their native forest.